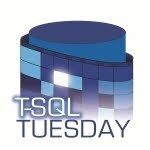 This month’s T-SQL Tuesday is hosted by Aaron Nelson (blog | twitter) with a theme of “logging”. Although Aaron’s definition of this topic is deliberately broad, I thought I would go with a more typical definition and talk about the approach I use for logging the actions of large multi-step stored procedures. Some of the work I do revolves around supporting and/or refactoring some pretty large ETL routines where often much of the work is carried out or at least managed by a single stored procedure which can have many, many individual steps. In the course of this type of work I’ve developed an approach to logging that has culminated in Log4TSql, an open source logging and exception handling library for SQL2005+. I’ve blogged previously about the exception handling part of this framework for T-SQL Tuesday #024 and this month’s T-SQL Tuesday theme leads nicely into the other half of Log4TSql. One of the challenges in logging the actions of a procedure that has so many steps is what to do with the information. Storing each individual log entry in a permanent table means increasing the pressure on disk resource during what might already be a very I/O intensive process. And if some or all of the load steps are wrapped in an explicit transaction and the code hits an error and needs to rollback, then you also lose the information that might help diagnose the very reason that the problem occurred in the first place. One solution to the rollback problem lies in using a table variable to store the log items which can then be permanently stored after any transaction handling has completed but that approach can still have an I/O impact whilst the main code is processing. So the approach I prefer is to use a varchar(max) variable within the procedure being logged and append each log entry to that, separated by some sort of line feed. This has the advantage of not being affected by any explicit transaction handling and also under normal circumstances has no disk I/O overhead. I like to separate each line with a carriage return to make it easier to read later. We will see how Log4TSql makes it simple to retrieve that information in an easy to read format later in this article. Probably the best way to demonstrate the approach I am proposing is by example. Most of the local variables used in the sample procedure below should be fairly self-explanatory but I’ve added a few thoughts about some of them here. @_Step – I always name each individual step in a multi-step procedure. This facilitates simpler logging using copy & paste code blocks and also makes it easy to identify the point of failure in case of error without having to use multiple TRY…CATCH blocks. @_Message – This is a succinct completion message indicating either that the process failed and why or that the process completed successfully. @_ProgressText – This is where we store the outcome of each individual step, number of rows, duration etc. Think of this like a log file, where each outcome is appended as a line of text. Also, a quick style note: I really like the fact that in SQL2008 we gained the ability to declare and populate a variable in a single statement thus DECLARE @_Error int = 0; so now I tend to use a similar single-line style when writing backwards compatible code for SQL2005 which goes like this: DECLARE @_Error int; SET @_Error = 0;. The aim of this type of logging is to record as much information as possible with minimal impact on performance. I like to include the number of rows affected and the duration of each step and will sometimes even include information from each iteration of a loop or cursor. This can help in identifying what was happening in the build up to any failure as well as being able to quickly tell historically which step is the bottleneck if performance suddenly falls off a cliff. One thing to be really careful of when appending new lines to @_ProgressText is that you protect against NULL values as one NULL may wipe out all your logging information (depending on your “concat null yields null” setting). Although, the ability to turn CONCAT_NULL_YIELDS_NULL off is more or less deprecated and in future versions trying to do so may generate an error so the sooner we learn to write defensively for NULLs, the better. This might seem like a lot of extra code to write so whenever possible, I try to use the following format for each step, which means that I can copy & paste the same block as a starting point then just change the value of @_Step and write the actual code. If you want to actually run this code, you can download the code for the [TSqlTuesday031LoggingExample] procedure here. You will also need to install the current version of Log4TSql into the database you are using for this demonstration. --! accidental NULL wiping out our carefully collected log detail. --! simulate the multiple steps in a data load or other complex process. --! where the exception occurred. --! the log record with a NULL. --! plus the number of seconds duration at which to show whole seconds. --! So if we pass in 3 anything up to 3999 ms will appear as "1345 milliseconds"
--! and if 4 secs or mor as "1 min(s) and 22 sec(s)"
--! ocurred and collecting the error number and formatted error message. After running multiple steps and appending the outcome of each to @_ProgressText, we must always populate @_Message with some final completion state (be that success or failure) and optionally, the duration of the entire process. Once we have all that information we pass it to log4.JournalWriter where @_Message along with most of the other values get stored in a table called log4.Journal and the value of @_ProgressText gets stored in log4.JournalDetail. If you’ve got as far as adding all this code into a test database, you can try running the procedure a couple of times like this. The first execution will generate an error but both attempts will log detailed information. We can now review the activity and run times for each step within our single procedure call in a nice, user-friendly format. 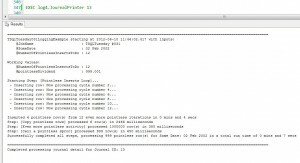 Incidentally [JournalPrinter] makes use of a stored procedure called [PrintString] which is part of Log4TSql and is designed to overcome the 8000 character limit in SSMS result sets and also the length limititions of the PRINT command in SQL Server. If you want to know more about this I’ve blogged about it here. I know that this level of logging may be overkill in some situations but in others it can be a real time saver. Given the choice, the way I prefer to write these monolithic procedures is to break out each logical unit of work into its own procedure – for example the DELETE from and INSERT into a single table. I like to think of each of these as “workers” and then all the workers get called in sequence by a single “manager” procedure. If using a pattern like this, you might ask why each worker isn’t responsible for its own logging. There are two reasons why I don’t do it that way; 1) you again run the risk of losing log information if transactions are rolled back by the manager and 2) the simpler each worker procedure is, the easier it is to maintain and, if necessary, tune. Just as a side note, if I am using the manager-worker pattern, each worker gets called like this. Note that the worker sproc always provides the number of rows affected as an output parameter so that the manager sproc can utilise that information in the log record. Log4TSql is an open source logging framework for SQL Server 2005+ written by Greg M Lucas on behalf of data-centric solutions ltd and licensed for public use under the GNU Lesser General Public License. You can download the latest version of this library along with all the source code from sourceforge. Please feel free to use and modify the library as you wish under the terms of the license. I am always interested in hearing how other people or organisations have put this framework to use.